Looking for something to do this weekend? The Yorkshire Food and Drink Show is in Millennium Square from Friday to Sunday. This is free event event which celebrates all the best Yorkshire has to offer by way of food and drink. 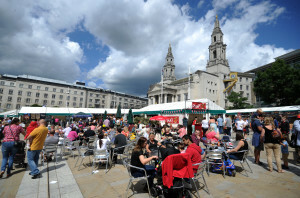 The festival will have live cookery demonstrations from leading chefs in the state of the art kitchen theatre – children’s activities and entertainment- artisan food and specialists exhibiting delicious produce – drinks and cocktail bars – street food plus a selection of Yorkshire’s finest restaurants cooking dishes from around the world. And, for the brave, the event will finish on Sunday with a chilli eating contest. Ps: the demonstrations and entertainment are free but take some money as you will probably be tempted by the goodies on offer at all the stalls! !